Centrally located on the famous Vrijthof Square, you will find Urban Residences Maastricht in a historic building, a former postal office. Urban Residences Maastricht has 19 unique apartments, all in Alessi-style and designed by top architect Wiel for your supreme comfort. From the designer kitchen with all the Miele top-notch appliances you could possibly think of to the homey living room and luxury bedroom. At Urban Residences Maastricht minimalistic design and luxury go hand in hand with comfort. Most apartments have two floors, some of which with (French) balcony. The penthouses have beautiful glass walls, the biggest landmark is the large penthouse with its oversized sundeck of 32m2. 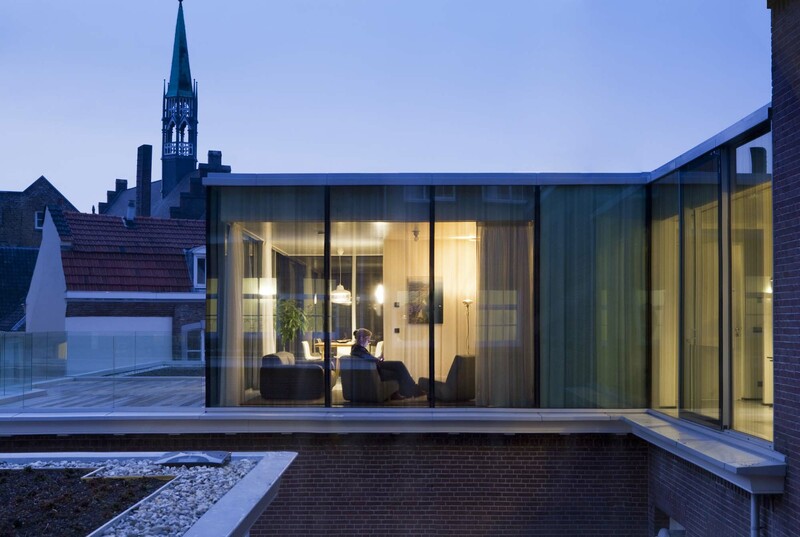 Urban Residences Maastricht offers different layouts and sizes ranging from 52m² – 96m2. We offer you hospitality, luxury and space in a historic setting in the centre of Maastricht. Enjoy our amenities such as housekeeping and reception and discover the city of Maastricht. Urban Residences is the ideal accommodation for a city break. With friends or family or a romantic getaway for two. Want to see more? No problem, trips to Belgium and Germany are definitely recommended. Think of cities such as Liege, Aachen and Cologne, all very nice cities to visit. We frequently welcome business travellers and individuals who stay for longer periods at Urban Residences Maastricht. Our concept meets their specific needs: privacy, space and comfort. You only need to walk out the door onto the Vrijthof square to find many restaurants and breakfast places. Recommendations are restaurants Piece of Cake, Taart and Monopole. For coffee, a simple sandwich or a drink we recommend De Perroen and D’n Ingel.